Written for, and originally posted on, the Central Seattle Greenways blog: http://centralseattlegreenways.com/2012/10/we-need-your-help-sr520-portage-bay-bridge-trail/. Reposted linked to by the Montlaker and Seattle Bike Blog. Is this post a little too long? Check out the shorter, easier to read version here and here! WSDOT needs to hear from us by this Friday – October 5th – about their proposed design preferences for the new SR-520 bridge design (click here for more information on these design preferences). Currently the design does not include a multi-use trail on the Portage Bay Bridge. The trail comes all the way from Redmond and then dead ends in Montlake rather than continuing to Capitol Hill and beyond. Redesign the Montlake lid area to incorporate bicycle and pedestrian needs from the ground up. This area serves as a hub for multimodal connections and must be designed to seamlessly, safely, efficiently, and comfortably create paths for people of all ages and abilities to travel to and form home, work, school, and businesses. The Montlake multimodal hub must connect the 520 bus station, UW light rail station, UW campus, Burke Gilman Trail, SR520 trail to the Eastside, new Arboretum Trail, and the Portage Bay Bridge Trail. Currently the level of service through this area has been given a failing grade by the independent analysts at Nelson Nygaard. Our neighborhoods, Seattle, and the region deserve, and should expect, world class facilities for people who take transit, walk, and bike. Email WSDOT at: SeattleCommunityDesign@wsdot.wa.gov (it is very helpful to include your name, what neighborhood you live and/or work in, and whether you are part of any neighborhood groups, are a home owner, have a family, etc). 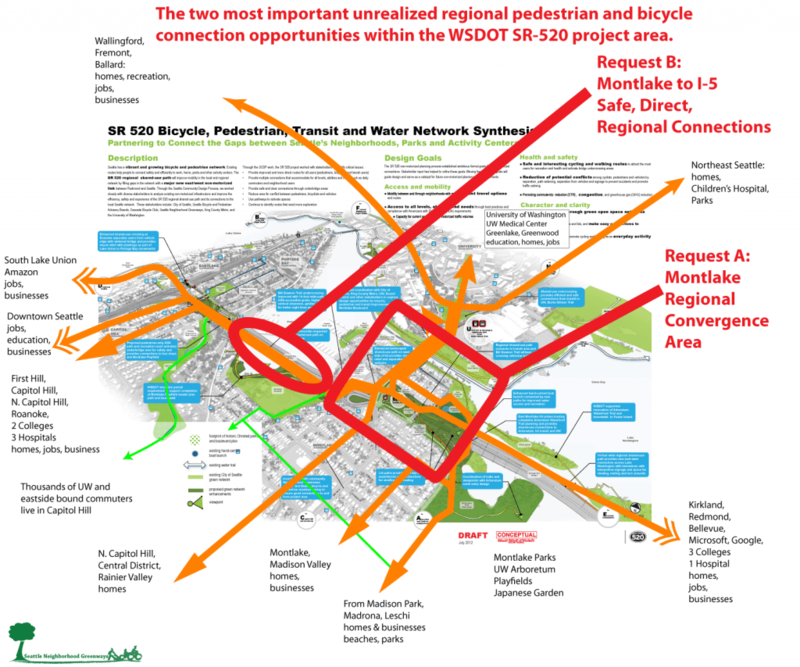 This image above helps illustrate the potential neighborhood, city-wide, and regional connections, and what is at stake is WSDOT does not get it right. I strongly support this: This will help children access the TOPS Public Elementary school as well as reconnect the Eastlake neighborhood to N Capitol Hill and Roanoke. It also provides access from the west to a Portage Bay Bridge Multi-use Trail, and the path from the Delmar Lid to Boyer and the Montlake Playfield. It serves essential neighborhood needs. It must ensure adequate connections across Boylston Ave E, and for bikers entering this path from Boylston Ave in either direction. Having this I-5 crossing buffered by plantings on either side will make the crossing a safer and more pleasant experience. I support this preference. This intersection needs to accommodate safe pedestrian and bicycle connections. The goal should be to design an intersection that allows children to cross E Roanoke St and 10th ave safely and comfortably. Roanoke Park is commonly used by children and they need to have a safe access. The I-5 crossing needs to be seamlessly connected to this area. This intersection should incorporate a refuge island if the crossing is widened from today. I strongly support bicycle and pedestrian shared-use paths on the Roanoke lid. A lid should not just be a space that keeps people on city roads from seeing SR 520. It has to allow pedestrians from the neighborhood, and cyclists to access Roanoke Park, a direct, safe connection to the UW and Montlake via the Portage Bay Bridge, the entrance of Interlaken Park, and the path over I-5 safely and comfortably. Additionally the paths should be laid out in such a way that they are direct, easy to follow, and with clear and easy to follow sightlines. This path must connect to the E Roanoke St overpass connector, Federal Ave E, Harvard Ave E, and a Portage Bay Bridge Trail in order to fully connect to the neighborhood, city, and region. Isolated green space that is not well connected to the community has been shown again and again to end up underutilized and a cause of public safety concerns. I strongly support. This will greatly enhance pedestrian access to the Portage Bay Multiuse-Trail and Waterfront, the Montlake Community Center and playfield, as well as Interlaken Park and Roanoke Park. It helps create a greenbelt loop around Montlake, just as was intended in the original Olmstead plan for the neighborhood. Stair climbs can not only provide pedestrians connections, they can also become recreational stairs for people wishing to exercise. Hopefully this connection will reactivate an entire area close to SR520 that currently sees some gang and drug activity. I strongly support WSDOT not just studying but actually implementing a pedestrian and bicycle trail on the Portage Bay Bridge. This trail linkage would fill a key gap that has been identified at the neighborhood, city wide, and regional level. It can be built at a tiny marginal cost addition relative to the rest of the SR520 project. It would allow people to travel easily and safely between the eastside, the UW, Northeast Seattle, Capitol Hill, Montlake, and downtown Seattle. Building this trail connection is a once in a lifetime opportunity to better connect our neighborhoods, city, and region with safe and family-friendly pedestrian and bicycle infrastructure. It would have positive implications for the safety, health, economy, and environment of our communities and the city as a whole. I strongly support further planning as to how people who walk and bike can safely and comfortably use this area. Montlake Blvd’s pedestrian and bicycle volumes are increasing quickly, especially on the west side. – The crossing of SR 520 and its ramps on the west side must be safe, direct, and comfortable. Using these criteria there is no choice except to re-imagine the pedestrian and bicycle connections through this area. These connections must be suitable for children, older person, handicapped person and the visually impaired. Crossing 7 lanes of traffic will never be safe or comfortable to these groups. This corridor is also a critical north-south corridor for pedestrian and bicycle commuters on their way to the Hospital, UW, the Burke Gilman trail, and future light rail station. Any solution that allows these people to bypass the on-ramps easily and comfortably will result in a better functioning interchange for motorized traffic at peak commuting time as well. – The West side sidewalk and the East side sidewalk as well as their continuation on the Montlake Bridge must give pedestrians a certain measure of safety from cyclists. – The bicycle and pedestrian connections from Montlake, east of Montlake Blvd and 24th Ave E. to the east side of Montlake Blvd must be away from HOV traffic and car traffic. There needs to be a way to connect from 25th Ave E. and Miller E. to the Arboretum trail and then on the East Lid followed by some kind of bridge over the ramps to connect to Hamlin without having to be in conflict with motorized traffic. Again, this will improve the efficiency of the Interchange at peak commuting hours and will make the experience safer for everybody. – Bill Dawson trail is unfotunately not a a good route for pedestrians or cyclists. The enclosed, poorly watched, and dark area underneath a huge span of highway will be gloomy and uncomfortable in the best of times and downright frightening at night. We must build a route that parents feel safe letting their kids travel to school on, the elderly feel comfortable walking to the bus station, and people on bikes feel excited to get out of their car and onto the saddle. Possible solutions: Route people at ground level or build them a mini west lid if needed. Allow the landscape architects and engineers to rethink the entire connectivity of this area. – A Safe Route To School must be provided along this corridor. While I support the goals of this preference to create a multimodal hub somewhere in the project area that is safe and pleasant for all users, there needs to be a new approach to the design. – The bulk of the pedestrian and bicycle movements will occur -much as they do today – on the West side of Montlake Blvd. That is where a “lid” is most needed. It would be prudent to use the limited lid dollars to fix the highest need multimodal problems rather than creating poorly used greenspace. – As long as access to the lid between 24th Ave E. and Montlake Blvd E. is through crosswalks across on and off-ramps, it is not suitable for much beyond catching buses. It is an island, cut off from Montlake on all sides and it is very small and likely not suitable for most active uses. pedestrian and bicycle access should be entirely separated from car and HOV traffic. The lid should allow them to cross SR 520 without having to wait at a crosswalks. The goal has been to reconnect the neighborhood, city, and region. It will not be met as long as pedestrians and cyclists have to cross ramps at crosswalks. This creates the perception that bikes are not equal to other modes of transportation and not convenient for everyday travel. The risk of crashes with cars and potential pedestrian conflicts is also increased by routing cyclists through crosswalks. This area is in the heart of a busy regional junction that connects to downtown, the University of Washington, hospitals, businesses, schools, the eastside, the Burke Gilman Trail, and many other important destinations. Perhaps, 25th Ave E. bike traffic could be routed at Miller E. over Lake Washington Blvd so that it merges with Arboretum trail, crosses the lid, and crosses the ramps using separated facilities. I support continuing to work with the city of Seattle to enhance the connectivity for pedestrians, bicyclists and transit users. The current proposals are not satisfactory. One potential improvement would be to continue the a trail over all lanes of traffic. While it is generally advisable not to unnecessarily gain elevation, the trail underpass will likely not be a facility that many feel comfortable. Giving people the option to continue over the ramps on a well lit, direct, comfortable, and paved trail will help to encourage vulnerable users to choose multi-modal forms of transportation. The goals for making good nonmotorized connections include: access and mobility, health and safety, character and clarity. These are built upon public feedback, existing bicycle and pedestrian master planning and best urban design practices. What is your feedback on these goals? The goals are good. But, your design for the Montlake Lid and the entire Montlake Blvd E. Corridor does not reflect adherence to these goals. It seems that the design for the lid was created without understanding of automobile, transit and most especially pedestrian and bicycle traffic in the adjoining neighborhoods and this sector of the city. Instead of creating a space designed for safe, direct and efficient pedestrian and bicycle crossings, thereby reuniting the neighborhood and creating a vibrant connection that benefits the entire city, the lid appears to be conceived simply as a way to hide the SR 520 scar, pollution, noise pollution. As an motorized vehicle interchange, the design replicates on a grander scale the existing outdated system which is the main source of backups (and pollution) extending from University Village to Boyer Ave E. Given that additional traffic (owing the removal of the Arboretum ramps and the re-routing of this traffic to this location) is being forced on this interchange, one cannot hope that it will function well for the city of Seattle. Worse, it is clear that the pedestrian and bicycle connections are an after-thought, stuck in corners of the area sometimes clearly unsafe (under SR520), condemned to use cramped spaces (the access to Bill Dawson), never designed to keep pedestrians and cyclists safe from cars and buses, created without a clear understanding of how people use the Montlake neighborhood and crossing of SR520 and the ship canal. The design needs to be entirely revised from the ground up, so that it meets the goals of Safe Routes To School, meets visually impaired commuters needs, takes into account the fact that foot (especially) and also bike traffic increases steadily on the west side of Montlake Blvd E (failed Level Of Service), demonstrates a genuine concern for safety for all expressed by a separation of bicycle and pedestrian traffic from motorized traffic, and offers direct routes on both sides of Montlake Blvd E., and on the eastern part of the project. Finally, the addition of a multi-use trail on the Portage Bay Bridge is an obvious choice: it will complete the trail that will cross Lake Washington on SR520 and will offer a connection to downtown, Capitol Hill, First Hill, and South Lake Union that does not exist. Your willingness to study this preference is greatly appreciated. This bicycle and pedestrian trail has the potential to offer a very viable alternative to other mode of transportations and to truly help Seattle increase significantly the number of people using non-motorized modes of transportation. The I-5 to Medina project provides a major new east/west nonmotorized connection with the dedicated regional shared-use path. How should the regional shared-use path connect or transition into Seattle? It should connect from Montlake to the Delmar Lid and tie in the developing network of bike routes and greenways leading to Capitol Hill, downtown and S. Lake Union. The I-5 to Medina project nonmotorized planning seeks to provide users of all ages and abilities opportunities for commuting, exercise and recreation by providing safe, comfortable and clear paths that connect important activity centers and destinations. Are there other refinements to the design preferences that can help better address user needs? The staircase from Montlake Blvd E. to the Bill Dawson tunnel should not connect at the tunnel entrance in order to reduce the risk of collisions. The Bill Dawson trail connection from the Montlake Blvd tunnel should not include 90 and 180 degree blind turns. The Portage Bay shared-use path must be added to the project. The crossing of SR520 for pedestrians and cyclists on the West side of Montlake Blvd must be safe, direct and separated from automobile traffic. The connections to the Montlake Bridge must be widened and made safer to meet the increasing levels of service. The sidewalks of the Montlake Bridge must be widened to meet the level of service. The connections from the SR520 shared-use path to the 25th Ave E and Arboretum routes as well as to the Portage Bay shared-use paths must at no point cause pedestrians and cyclists to cross highway ramps on foot. The 25th Ave E. bike route can be merged with the Arboretum bicycle trail and connected at E. Miller. A modern anticipatory sensor activated crossing light should be provided. The Delmar Lid to Boyer path is a good response to a a real neighborhood need for a safer pedestrian connection. It is not a viable bicycle commuting route due to the steepness of the slope, but can be used by people willing to push their bicycles. It is not an alternative to the Portage Bay bridge Shared-use path. Pedestrians and bicyclists should not be routed to dark areas under SR520. Finally, children must be offered Safe Routes To School, and safe routes to public libraries and playfields, and the needs of handicapped commuters need to be met. The I-5 to Medina project nonmotorized planning process has included diverse stakeholders and agencies as part of the design conversation. Which stakeholders, best practices, examples or other planning documents should we add to the process? In Seattle, the Montlake area acts as a multimodal hub. This could be a world class hub that better connects transit, pedestrian, and bicycle amenities and puts us on the path to a healthy, sustainable, and affordable future. To do this, the needs of pedestrians and cyclists must be a foundation for the entire project. Do you have other thoughts you would like to share with the project team? It is worth noting that the design process only started collecting input from the pedestrians and the bicycle community at a late stage. Other stakeholders obtained concessions early on that emphasized using the lid as a screen rather than as a green and multi-modal hub.